I was recently taken advantage of in a small financial matter. It was not an enormous amount (no need for a paypal button at the bottom of the article!) but it turned someone I had considered an old friend into an acquaintance. In times like that it is hard to see the good in human nature and we often tend to despair of our neighbor. How often does the kindness one attempts, end up (admittedly possibly subconsciously) being picked up as a weakness to be exploited? However, to look at it from a different perspective, such experiences can sometimes help us recognize what our place as Christians in this world is meant to be. It bought to mind the following ‘letter to Diognetus’ and being considered an alien in one's own land. This beautiful apologetic for the Christian life in time of persecution is of great spiritual solace for those attempting to ‘hold the line’ of the great work of Archbishop Lefebvre as we witness the Fraternity he created imploding. Occasionally I am told of (and also witness) the great trials of those who refuse to cave in and therefore return to the ‘comforts’ of wilful blindness in the Fraternity, instead continuing to support the occasional masses offered by the too few Resistant priests. How much easier it would be too be part of the, ahem, internal resistance and receive all the benefits of being part of the Fraternity whilst all the time being opposed to its ultimate, admitted, aim of reconciliation through a Personal Prelature. Among the difficulties are the lack of spine in those who we would have always admired. Catholic Family News has recently appointed Menzingen apologist Brian McCall as Editor and recently I noticed in The Remnant Newspaper a ‘feel good’ article about the ordinations from traditional orders over the summer. Being as trad ecumenical as possible of course they are all there, SSPX, Good Shepherd, ICKSP, FSSP but wait, hold on, someone is missing!? Surely there must be some mistake? 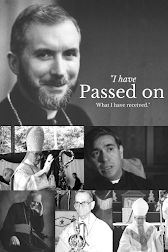 What about Father Juan Bautista OSB ordained by Dom Thomas of Aquino? Of course I jest, he is not there for a reason. Now I must admit I like Michael Matt, I have followed his path from hard-line FSSP to SSPX apologist and I sincerely believe that he is opposed to a SSPX/Rome deal, possibly due to witnessing the FSSP protocol 1411 debacle. But his ‘deceit’ aids no-one. There can be no doubt that the General Chapter is a source of great concern to the hundreds of thousands of SSPX supporters worldwide, yet no priest who opposes such a move from the Resistance would be offered an opportunity to debate in the pages of The Remnant in-spite of the huge interest there would be in one. It would be uncharitable to assign this to financial concerns regarding paper sales, none of us are in a position to judge his intentions. However, if he is indeed opposed to a SSPX deal then why carry on the pretense that the resistance does not exist and that a priest who is a member of the SSPX one day and leaves over the same concerns that he has, is persona non-grata in The Remnant from that day forward? As for those brave soldiers who find themselves in the wilderness through no other reason than geographical location and lack of resistant priests, the lack of community for these people can have long term harmful effects, for example despair. So what can any of us do to help? Two small suggestions, not perfect, but a little help, are the two following radio stations which at least offer some small daily spiritual comfort. Traditional Catholic Radio simply offers spiritual music, sermons and catechism etc. What makes it interesting is that it quite often features Bishop Williamson and pre-resistance Fr Pfeiffer etc. This station regularly offers very interesting talks and should be in the background particularly of any stay-at-home Mom. The second is actually by SSPX supporters but in most ways is decidedly ‘old-school’ and features interviews with the likes of Frs Peter Scott, Edward Black and Stephen Webber. It offers news as well as interesting interviews. It can be found here. Networking is vital in our situation and everyone should be able to do a little to help those in the above mentioned situation whether it be a lift, a visit, loaning of literature, recommending websites etc. If we are truly living like aliens as mentioned in the ‘letter to Diognetus’ then let us help our fellow aliens as much as we can. Thanks, from the stay at home mom. Newly resistant.